World War I Commemorative Book Series. Back to 2014 For King and Empire - 1914. Forward to 2016 Courage & Commitment - 1916. This issue follows on from the one issued in 2014 called "1914 For King and Empire." That first issue saw the beginning of World War I and the sending of troops to fight overseas. Now a year later we find the New Zealanders fighting in Gallipoli, along side soldiers from Australia. 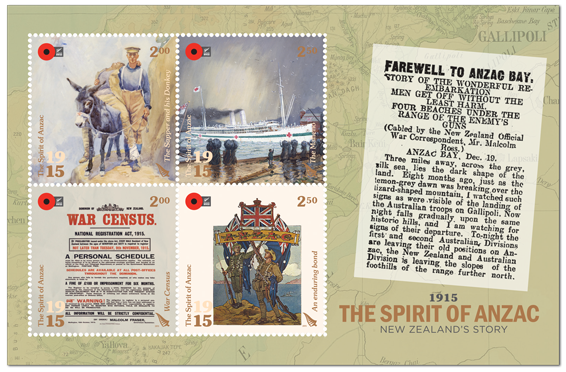 Over the next three years, there will be three more issues as we follow the story of New Zealand's involvement in the war. 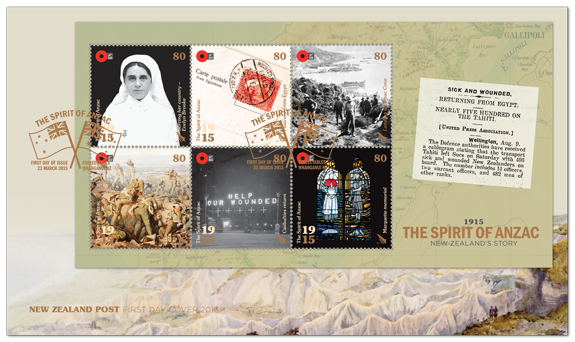 In 1915 New Zealand’s role in the First World War reached a new level. In near-impossible conditions, the New Zealand Expeditionary Force took part in the Gallipoli campaign alongside our Australian neighbours. 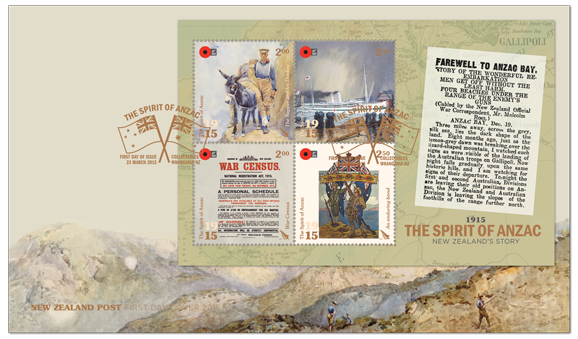 The Australian and New Zealand Army Corps (ANZAC) was formed and the spirit of Anzac lives on today. That is where the word 'ANZAC' comes from, little known in other parts of the world but so famous in Australia and New Zealand. Ever since they fought together in Gillipoli there has been a close relationship between the two countries. More recently a closer bond has been formed with Turkey as well. In 1998 New Zealand and Turkey did a joint issue '1998 Memorial Statues - Joint Issue with Turkey.' You can find this in our collection, Military/ANZAC Part One. 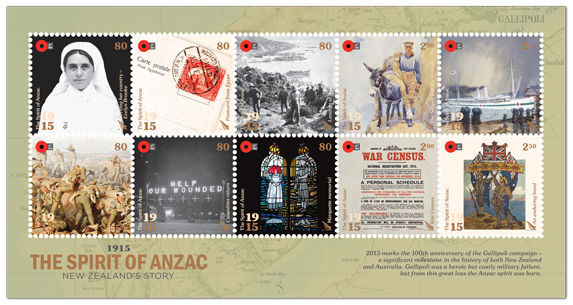 One of the stamps in this issue is taken from a painting called Simpson and his Donkey. Simpson was an Australian stretcher-bearer who found a lost donkey wondering in the beach. Together the two of them worked being wounded soldiers down to the beach so they could be taken back off by ship. See our post on Simpson and his Donkey. Once again this issue had a rather confusing range of coins and stamp related items but also once again the stamps were not sold separately. I have tried to arrange some of these stamp items in an organised manner. Later, when I get a better quality image I will add the individual stamps. There are 10 stamps in this issue. They in 3 denominations - 6 x 80c; 2 X $2.00; 2 X $2.50. 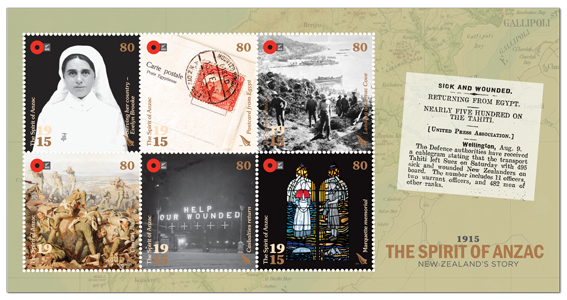 They can best be viewed in this sheetlet seen above or, for those who like to learn more about each stamp, the commemorative Book below. 80c Evelyn Brooke – Serving her Country. A New Zealand nurse, one of more than 500 nurses serving overseas during World War I and the only NZ nurse awarded the Royal Red Cross and Bar. By the war’s end, she had served in Samoa, Egypt, off the shores of Gallipoli on the Maheno, and New Zealand, England and France. 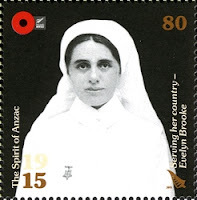 Nursing Matron Brooke (1879—1962) is also the subject of the premium booklet, the second in the series of five booklets, once again a well-produced and interestingly written souvenir. Chunuk Bair is at the crest of the Sari Bair massif in the Dardanelles, which was a strategic goal for Anzac troops during the Gallipoli campaign in August 1915. During fighting for Chunuk Bair New Zealand troops suffered very heavy casualties. 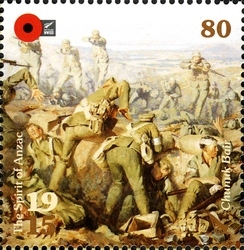 The stamp shows a painting by Ion Brown, in 1990 which shows a chaotic scene on the summit of Chunuk Bair, which the Wellington Battalion occupied at dawn on 8 August 1915 and held all day despite suffering casualties of nearly 90 per cent. The summit was lost to a Turkish counter-attack two days later..
Today this point is the centre of New Zealand's ANZAC services around a memorial to the New Zealanders who fell fighting for this hill. 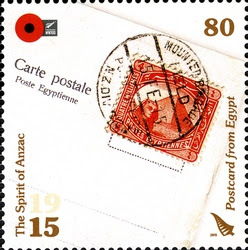 An Egyptian Carte postale Poste Egyptienne postcard, franked 4m red, postmarked 15 Feb 1915 NZ Division Mounted Rifles Brigade Field Post Office posted by Llewellyn Beaumont in Egypt. Before the Gallipoli campaign began in April 1915, New Zealand troops had spent the best part of the new year in Egypt training for combat in a then-unknown theatre. The first New Zealand casualties returned home in July 1915. As the fighting wore on, the cost of supporting disabled and recovering soldiers back in New Zealand grew, and communities responded through fundraising by ‘patriotic societies’ and Queen Carnivals, a kind of hybrid talent show and market designed to generate enthusiasm and funds for the wounded. 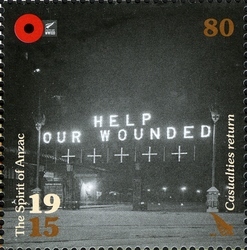 The stamp shows an illuminated sign at night “HELP OUR WOUNDED” as part of the fund raising drive to help wounded returned servicemen. 80c Landing at Anzac Cove. The first ANZAC troops of the disastrous Gallipoli Campaign landed at Anzac Cove on 25 April 1915. Eventually, more than 12000 New Zealanders fought at Gallipoli and devastatingly 2779 lost their lives there and 4752 were wounded. In spite of this terrible cost, they made little progress beyond the beachhead established in April. On 25 April 1985, the Turkish government officially recognized the name "ANZAC Cove". 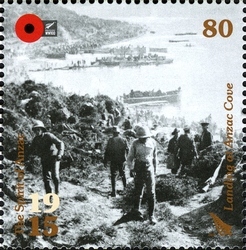 There have been a number of New Zealand stamps depicting ANZAC Cove and the landing here but I believe this is one of the better ones. The troopship Marquette was sunk by German Uboat U-35 in the Aegean Sea on 23 October 1915. Ten New Zealand nurses on-board at the time also lost their lives. The stamp shows New Zealand’s first hospital chapel was built in 1927–28 in the grounds of Christchurch Hospital to commemorate the sinking of the troopship Marquette. 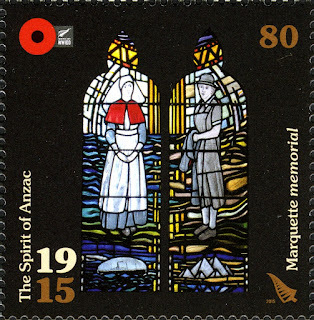 This stamp shows part of a stained-glass window within the chapel depicting a First World War nurse above the ship. Beside her, a Second World War nurse is shown above the pyramids of Egypt. $2.00 The Sapper and His Donkey. Stretcher-bearers using donkeys carried numerous wounded men to safety during the Gallipoli campaign. 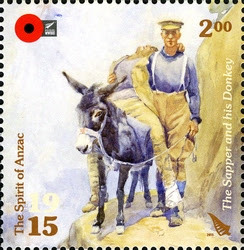 The stamp shows a watercolour painting by Sapper Horace Moore-Jones entitled ‘The Sapper and His Donkey’ or ‘Simpson and His Donkey’, 1917. The painting sold in Auckland on 3 April 2015 for $257,950. See our post on Simpson and his Donkey. Between 16 October and 9 November 1915 every male resident of New Zealand between the ages of seventeen and sixty had to complete a ‘War Census’, a personal schedule under the National Registration Act 1915. Forms were available at all Post-Offices throughout the Dominion. This meant men could be drafted for the Armed Forces or moved to employment better suited for the war effort. We talk about freedom and choice, back then there was hardly any. Basically, you were told where to go and what work you would be doing. 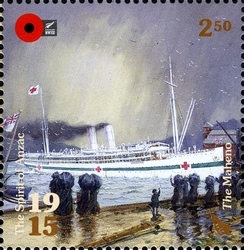 The ‘Maheno’ was New Zealand’s first hospital ship entering the war effort in July 1915. Hospital ships were often converted passenger ships, painted white with large red crosses on their sides. When the Gallipoli campaign was being planned, few foresaw the need to provide hospital ships for the treatment and evacuation of the wounded. In July 1915, as casualties mounted, the Maheno left Wellington for Egypt, with a matron, 13 nursing sisters, five medical officers and 61 orderlies among the personnel on board. 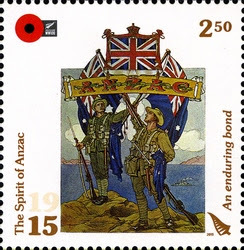 This stamp depicts a poster by Australian soldier Otho Hewett showing the beginning of the Anzac tradition. It was featured in ‘The ANZAC Book’ compiled by Australian war correspondent CEW Bean published in early 1916. 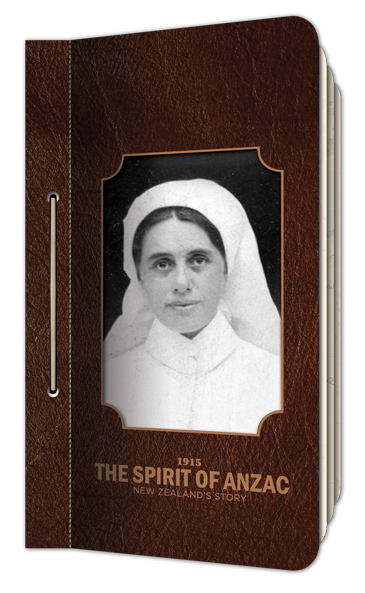 The ANZAC Book told the story of the Gallipoli campaign through satire, poetry, and illustrations. Campbell Paterson Newsletter - VOLUME 66 NUMBER 12, JULY 2015 page 2. There were two miniature sheets as well. The top one, of four stamps, shows the higher values, while the bottom one, of six stamps, shows the low values. Date of issue: 23 March 2015. The number of stamps: 10 gummed stamps. 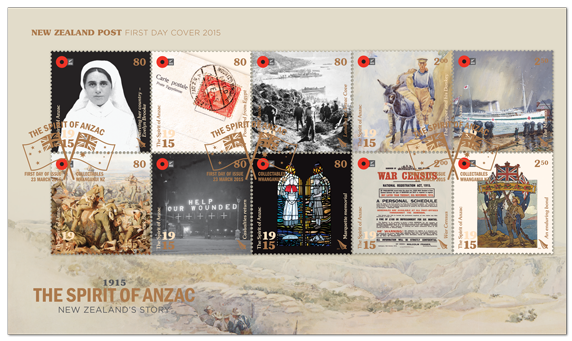 Stamps and first day covers designed by: Strategy Design and Advertising, Wellington, New Zealand. Denominations: 6 x 80c, 2 x $2.00, 2 x $2.50. Printer and process: Southern Colour Print Ltd by offset lithography. 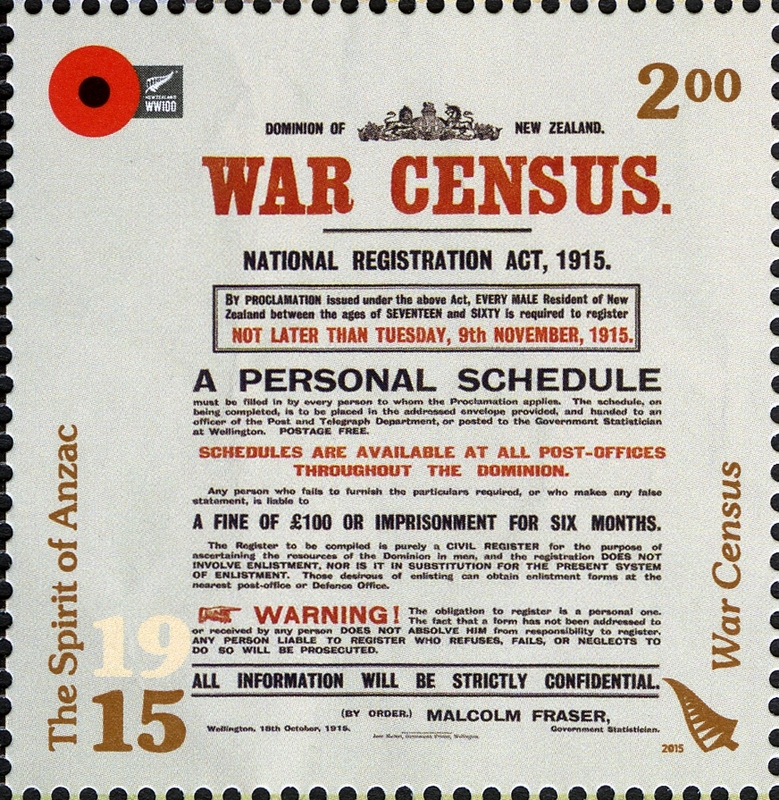 Period of sale: These stamps remained on sale until 22 March 2016. First-day covers remained on sale until 23 May 2015.